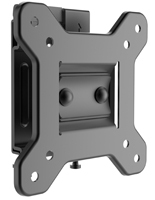 A TV tilt mount offers one extra feature our standard fixed-mount styles don't: vertical tilting. What difference does that make? A lot if you plan on installing monitors high up on the wall. 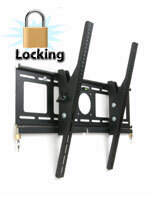 A TV tilt mount will accommodate the extra height with better flexibility (and viewing angle). 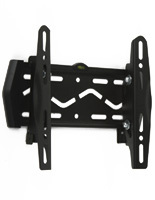 Our universal TV wall brackets handle a wide range of LED screen sizes and of course are always VESA compatible. 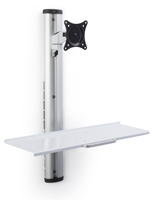 If you are searching for an economical TV tilt mount to outfit your retail store or bar, look no further. 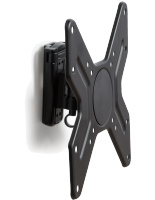 We stock these flat screen mounting fixtures for same day shipment. 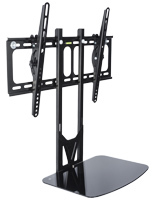 What should you look for in a commercial TV bracket? These TV tilt mounts are fundamentally not too different from any standard fixed model. 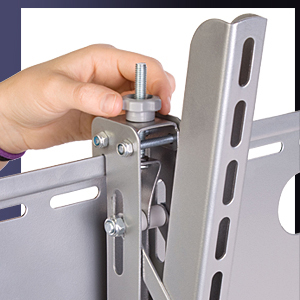 A horizontal bar screws onto the wall while vertical support arms screw to the rear or the monitor. The arms then simply hook onto the wall bar. The tilt feature comes from the support arms. Loosen the bolts located on the sides of the arms in order to adjust the tilting angle. Some models come with convenient knobs that make this process of adjustment very easy. The range of tilt is usually between 15° and 20°. The least expensive models in this category come with side panning. While they do not support large and heavy LED TVs, they do offer more adjustability. 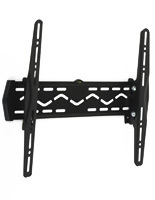 These universal TV mounts are VESA compatible, meaning they come with hole patterns that match up with the mounting holes located behind your flat panel TV. The Video Electronics Standards Association standardized this important task. Prior to this standardization, it was difficult to match the flat screen to the bracket. We guarantee that our fixtures will fit any brand of LCD, LED, or plasma television, including Panasonic, Sony, LG, Toshiba, Samsung, and Vizio, among others. 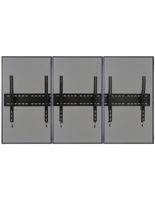 These TV wall fixtures are ideally suited for airport or bus terminals, sports complexes, and convention centers. Any establishment that displays directional or informational content usually needs to locate the screen high up on walls. Same goes for TVs showing entertainment or sports games in bars and restaurants. Placed above head height, said screens will require a downward tilt in order to be viewed correctly. By this we mean to prevent the distraction of overhead lighting or glare from windows. Installing a flat panel monitor using one of our products is fairly simple. One of the most important points to make is you will need to screw the bracket into wall studs or some other solid surface. If this isn't possible, we recommend the use of hollow wall anchors. But be careful when attempting to mount a very heavy screen (upwards of 100 lbs.). Take this under consideration - if you are installing anything inside a commercial or retail establishment where the monitor will be placed above bystanders, by all means get it mounted professionally.